Geryon, a young boy who is also a winged red monster, reveals the volcanic terrain of his fragile, tormented soul in an autobiography he begins at the age of five. As he grows older, Geryon escapes his abusive brother and affectionate but ineffectual mother, finding solace behind the lens of his camera and in the arms of a young man named Herakles, a cavalier drifter who leaves him at the peak of infatuation. When Herakles reappears years later, Geryon confronts again the pain of his desire and embarks on a journey that will unleash his creative imagination to its fullest extent. 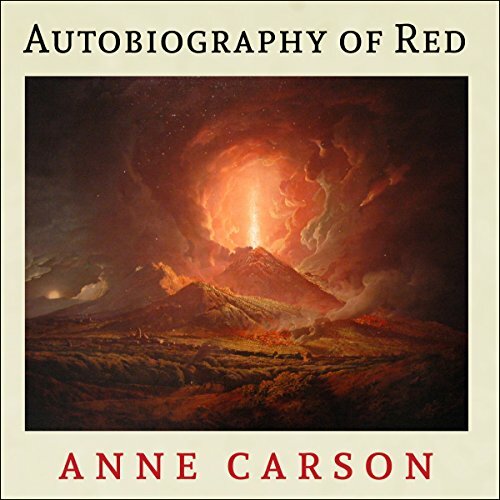 By turns whimsical and haunting, erudite and accessible, richly layered and deceptively simple, Autobiography of Red is a profoundly moving portrait of an artist coming to terms with the fantastic accident of who he is. The reader’s interpretation of this book makes it beautiful and clear, where it is not always clear to read silently. Refreshing original narrative. Captivated my imagination and understanding each moment of the literary journey. Anne Carson is a star writer. What a magnificent artistic vision. I felt truly transported by the descriptions, like I was there myself zoomed into every detail. Could not understand or get into it. Not the authors fault based on the awesome reviews. Apparently not my style of writing.